Jeff VanderMeer discusses his approach to environmental storytelling. The acclaimed speculative fiction author spoke in Harris Hall on Friday. Author Jeff VanderMeer said the experience that most informed his portrayal of nature in the novel “Annihilation” was an incident in which he became paralyzed with fear after encountering a panther. “That feeling of lack of control, but also acceptance and immersion into nature, is something people rarely feel in their lifetimes, but it’s very exciting in a way,” VanderMeer said. The author, who focuses on environmental storytelling — which emphasizes creating immersive experiences for readers — spoke Friday at Harris Hall during an event sponsored by the Environmental Humanities Research Workshop in the Alice Kaplan Institute for the Humanities. VanderMeer is most famous for his Southern Reach Trilogy, a series following an organization and its exploration into an area of the United States that has been abandoned and reclaimed by nature. “Annihilation,” the first book in the series, won him a Nebula award and Shirley Jackson award in 2014 and was adapted into a 2018 film starring Natalie Portman. 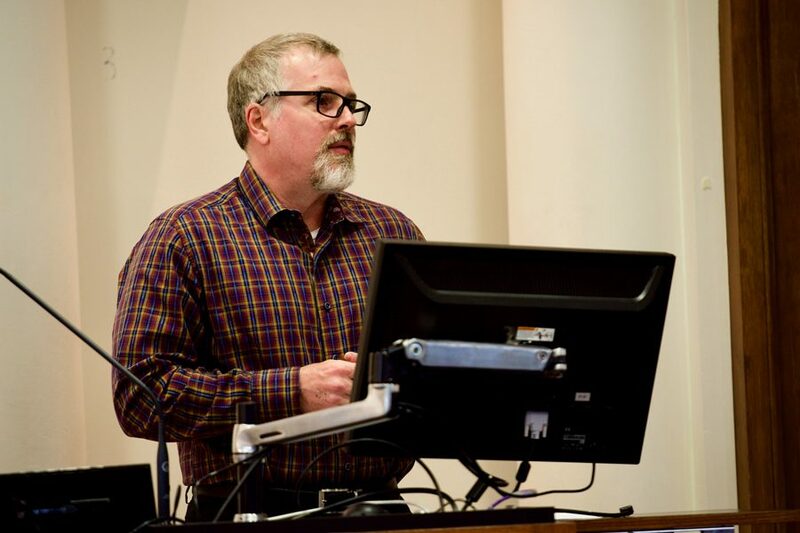 History Prof. Keith Woodhouse, who introduced VanderMeer at the event, said the author’s speculative fiction work belongs in the category of “weird fiction,” a subgenre defined by unconventional and subversive takes on science-fiction and fantasy. During the event, VanderMeer discussed how his personal experiences shaped his work and informed his interest in environmental storytelling. He said the environment depicted in the Southern Reach Trilogy is largely inspired by his exploration of nature in St. Marks, Florida. The dreamlike, uncanny environment in his books reflects the unexpected and unusual wildlife he encountered during his hikes: He said he thought he came across a dolphin in a river and saw a kangaroo out of the corner of his eyes. VanderMeer also said another source of inspiration for his trilogy was essayist Timothy Morton’s concept of hyperobjects — objects so vast in temporal and spatial place that they essentially exist everywhere and are almost impossible to fully comprehend. VanderMeer said he drew from Morton’s concept when creating the area of the U.S. depicted in his novels. Graduate student Adam Syvertsen, who attended the event, said he hadn’t read a single book by VanderMeer but wanted to learn more about environmental storytelling. He said he was impressed by the imaginative concepts that VanderMeer described and the intellectual reasoning behind his depictions of the environment. “I’m still not quite sure what environmental storytelling is, but I’m definitely interested in learning more, and it seems like a particularly important form of storytelling to use now,” Syvertsen said. Woodhouse said although VanderMeer writes speculative fiction, his work is relevant and important because it touches on environmental change affecting the world today. “VanderMeer often writes about the unknown and the unpredictable, that which is vaguely familiar but still threatening, which is one reason why his stories are so useful in this era of climate change and environmental transformation,” Woodhouse said.